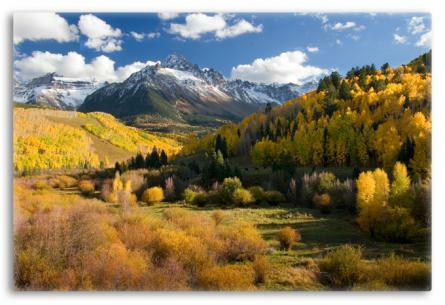 Sneffels peak in Colorado's San Juan Mountains during autumn. The contrasting bright yellows of the canvas art piece compared to the blues in the clouds and background makes it interesting to look at. The Sneffels peak in Colorado’s San Juan Mountains leaves someone feeling the desire to relax and love life and not necessarily in that order. A home wall decoration conveying an Autumn scene adds flavor to any home.